Over the last few weeks, I’ve seen a lot of people look back on 2013 to review the highs and lows. I’ve seen a lot of people look forward to 2014, carefully planning out their goals and events to run or ‘tri’. While I can easily partake in the reviewing, I must take the unusual path regarding the planning. My husband can vouch for the fact that I’m perfectly fine doing something until either everyone seems to be doing it or someone TELLS me to do it, and then you’ll see my heel marks in the dirt all the way. First, let me look back on 2013. 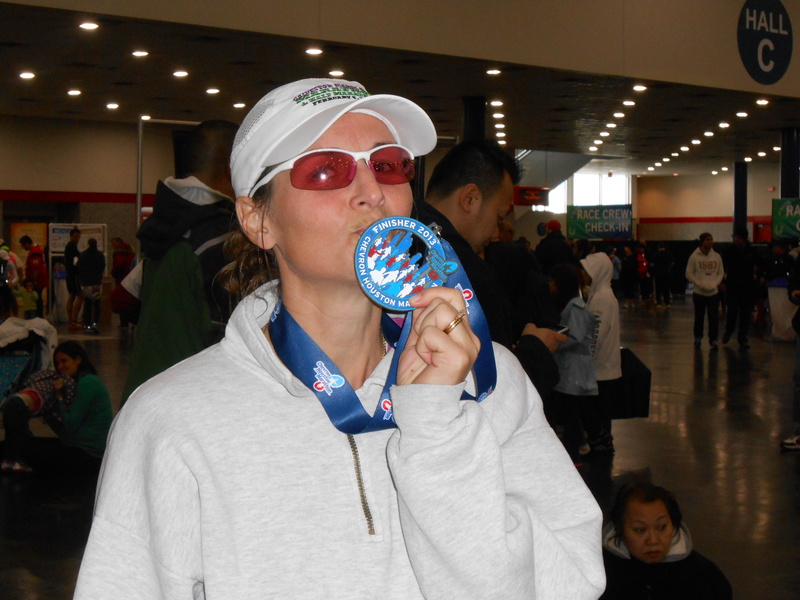 It started off with my best and worst marathon, all wrapped up in one race, the Houston Marathon in January. When race day approached, I felt I could have trained a little better, prepared myself a little more. I’ll never know if that would have changed the outcome of the race, but it’s a feeling I didn’t like, so I chalk it up to a lesson learned. The race itself was my fastest and strongest race, even though it started in a downpour that let up to rain for nearly the first ten miles. I have to include the mental meltdown that occurred while walking/running/freaking out while heading to the start corrals, most likely caused by knowing I was going to 1) run a marathon 2) run a marathon with rain and wind and 3) need a bathroom. This meltdown included crying, yelling, thinking the world was coming to an end, and then finally, laughing as I hovered my poncho and four other layers over my shoes to keep them dry as I waited in line to use the port-a-jon while it was absolutely POURING rain. I remember thinking or even saying, “WHO DOES THIS?” and looked around and realized that several thousand other people were doing it and were just fine. It diverted my attention from the previous list, and looking back, it was pretty funny. Totally unnecessary, but funny. Another lesson learned: Don’t freak out. No matter how much you think you need to, just don’t. I ran my best race and finished with a BQ in 3:43:18. In the spring, I ran just for fun, and even ran a mud race for the second time. Fun. In May, my husband took a job that would move us from southern Texas to coastal North Carolina over the summer. This was a dream come true. My sister and I would live less than a mile from each other. I kept on running for sanity and in August, began training with the Without Limits team. We slowly settled in our house, but I think we are still shell-shocked from making two huge moves in two years with our two kids and four cats, including buying and selling our houses. In September, I developed excruciatingly painful shin splints, so I had to make adjustments to my marathon plans, defer my entry to the 2014 Houston Marathon, and even the Myrtle Beach Marathon as a back up. Lots of doctor visits and cross-training later, I’m finally healthy. During that time when I was dealing with the injury, I was able to submit my entry into the Boston Marathon. After waiting TEN excruciating days for the registration period to end and for the BAA to verify times, I found out I got in by a mere four seconds. Par-tay. 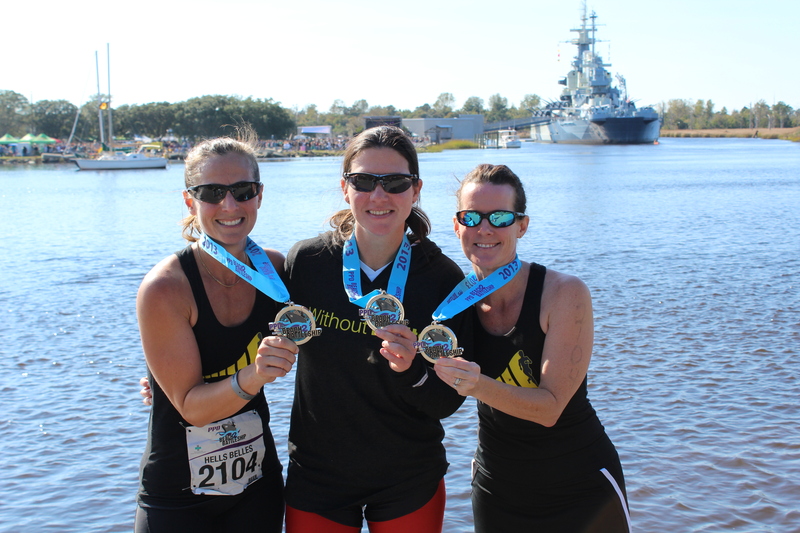 In October, I was on the Beach 2 Battleship 1/2 Iron Distance on the Hells Bells relay team. I ran the 1/2 marathon, which was pretty much, the perfect race, even with injury and feeling like crap that morning. According to my watch, I was able to run a PR at 1:44:11. My sister swam and our friend, Wendy, rode the bike portion. What a great time!!!!! I started swimming this fall so I could start doing triathlons in 2014. That has been an experience and let’s say that swimming is teaching me patience and perseverance. Not many things besides motherhood can do that. I was able to run two of my 2nd fastest 5k races this fall and win the masters female division. That was cool. Being 40 ain’t that bad! I started “real” training for the Boston Marathon just a few weeks ago, and we are now 16 weeks from race day. As I leave 2013 behind, I look for this race to be the race of all races. I don’t know how I will perform, but I’m setting myself up for success. The thing with marathons is that each one is it’s own organism. So much can go wrong and so much can go right along the way, and you can have bad outcomes with all the training and preparation in the world. You can even have a good outcome when things have gone wrong along the way. I am not pinning all my hopes on this one race, because it’s more about the experience than the actual time on the clock when I cross the finish line. Let’s be honest here though. Of course I would love another qualification, but really, marathons aren’t going anywhere, and I feel very lucky to just be a part of the field for the 2014 race. My family will be there to celebrate with me, and we are going to soak up as much of Boston as we can. We already have tickets for the Red Sox/Yankees game. I get butterflies when I think of our trip to Boston. To help prepare for Boston, I plan on running the Myrtle Beach 1/2 marathon on February 15th and then two segments of the Quintiles Marathon relay totaling 16.2 miles. Racing in prep for a marathon always helps me mentally, plus it’s good to practice the fueling and hydrating strategies BEFORE the marathon. After Boston, my only plan is to train for and then compete in the Beach 2 Battleship 1/2 Iron Distance. My husband does NOT believe me when I say that my only goals are to 1) not drown and become shark bait, and 2) not come in last. I don’t feel it’s fair to put a time goal on myself for something that I’ve never done before. Plus, I figured there should be ONE event that I do that can just do and not worry about going faster. (This time anyway 🙂 Heehee!) I admit, I’m extremely intimidated by this goal. That is probably the biggest factor in me signing up for it, too. I don’t know what other races I’ll be doing and at this point, I don’t care. I don’t have it all mapped out, and honestly, for once, it’s a good feeling. I’m even going to go watch my husband run a 1/2 marathon in Ocean Isle and NOT run, not even the 5k. He’s supported me through years of running and racing, so it’s time I attend a race as purely a spectator. It’s been so long, and I’m truly looking forward to it! So, yes, I have some pretty big goals and events going on in 2014, and I have a plan to achieve those goals. Just last week, I had thought about 2014 and decided that if I don’t re-qualify for Boston IN Boston, I would find a race a few months after that and try again. And again if needed. Then I thought about how annoying, expensive, and time consuming that would be, especially during the summer, and I changed my mind. I don’t need it this year. I want to spend time at the beach, our pool, and with my family and friends, AWAKE. And like I said before, marathons aren’t going anywhere, and I don’t plan to stop running them, so I don’t have to run all the races this year. It’s time to put my best effort into the ones I’m going to do while always remembering to enjoy them when I get there. Isn’t it really about the journey anyway?